After having posted about the basics of distance functions in several places (pouet, my blog, shadertoy, private emails, etc), I thought it might make sense to put these together in centralized place. Here you will find the distance functions for basic primitives, plus the formulas for combining them together for building more complex shapes, as well as some distortion functions that you can use to shape your objects. Hopefully this will be usefull for those rendering scenes with raymarching. You can see some of the results you can get by using these techniques in the raymarching distance fields article. Lastly, this article doesn't include lighting tricks, nor marching acceleartion tricks or more advanced techniques as recursive primitives or fractals. In case you are looking for 2D SDF functions, you'll find them in the 2D Distance Functions page. All primitives are centered at the origin. 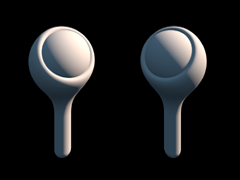 You will have to transform the point to get arbitrarily rotated, translated and scaled objects (see below). Once we have the basic primitives, it's possible to apply some simple opearations that change their shape while still retaining exact an euclidean metric to them, which is an important property since SDFs with undistorted euclidean metric allow for faster ray marchine. Sometimes you cannot simply elongate, round or onion a primitive, and you need to combine, carve or intersect basic primitives. Given the SDFs d1 and d2 of two primitives, you can use the following operators to combine together. These are the most basic combinations of pairs of primitives you can do. They correspond to the basic boolean operations. Note that opSubtraction() is not commutative and depending on the order of the operand it will produce different results. Since rotations and translation don't compress nor dilate space, all we need to do is simply to transform the point being sampled with the inverse of the transformation used to place an object in the scene. This code bellow assumes that transform encodes only a rotation and a translation (as a 3x4 matrix for example, or as a quaternion and a vector), and that it does not contain any scaling factors in it.